‘Classes’ in the more narrow sense of the word only emerge with capitalism - but the disappropriation from the means of production on which the property-less state of the proletarian is based, has not been a singular historical process. Disappropriation is a daily reoccurrence within the production process itself: workers produce, but the product of their labour does not belong to them. They only get what they need for the reproduction of their labour power, or that according to the living standard that they have claimed through struggle. Generations of ‘scientific management’ researchers have tried to expropriate workers' knowledge of how to produce in order to become independent from them. They have established parallel production units in order to be able to continue production in case workers go on strike. They have closed down and relocated factories in order to be able to increase exploitation of, and control over, new groups of workers. But they were not able to exorcise the spectre. During the strike-waves of 2010, for the first time it haunted all parts of the globe simultaneously. These struggles are currently in the process of changing this world. Even academia has become aware of it and after a long time has turned the working class into an object of their research again – as numerous publications, new magazines and web-pages demonstrate, through which left-wing social scientists try to create links between workers in different continents. In Germany for the last 25 years, workers were left alone with their struggles – here, as well, social movements and intellectuals have started referring to them again. For people at the time, the 1980s in Western Europe were contradictory times: on the one hand massive attacks, on the other hand, radical social movements. But seen from today’s perspective it was a decade of dramatic defeats. Austerity politics lead to a dismantling of welfare entitlements and/or these were more tightly linked to actively seeking work. Images from the US showed long queues of unemployed people in front of recruitment agencies, portraying the new dimension of impoverishment of the US working class - a working class that used to be so powerful. In Germany during the mid 1980s, trade union mobilisation for working-time reductions (to combat unemployment!) in return for the flexibilisation and casualisation of ‘normal permanent work contracts’ marked a watershed. The 1980s are represented by military dictatorships and economic decline in large parts of Latin America, state bankruptcy in Mexico, the debt crisis and IMF dictates to enforce ‘structural adjustment programs’. This example did not repeat itself in Berlin or Leipzig. There the regime surrendered. When the wall fell in 1989, Wildcat approached the collapse of real existing socialism optimistically. In 1988/89 class struggles in West Germany had intensified and in the course of the regime-change in the east we witnessed mass debates in local workplaces and on the streets about a social future beyond capitalism and GDR socialism - which today has been long forgotten. The economic devastation of the former GDR initially triggered a broad movement of struggle against factory closures and the deterioration of social services. Following the massacre of the Gulf War in 1991 and the onset of the economic crisis, which was delayed in Germany due to the post-reunification boom but then kicked in even harder in 1993, we saw a massive collapse of existing conditions in the metal industry in the former West Germany. Trade unions did their bit to rescue Germany as the ‘export-nation’, for example in 1994 the IG Metall (metal union) accepted an intensification of work and massive flexibilisation of working times in the 'Agreement of Pforzheim'. In addition, welfare benefits were attacked across the board. Struggles that were hoped for - mainly in the factories that were in the process of being dismantled in the former east of Germany - largely did not materialise. The migration of high-skilled workers from east to west worked as a safety valve for social pressure - and resulted in wages dropping for the first time in the west during the post-war period. Mass unemployment in the east was buffered through various means e.g. companies would send workers on training programs continuously because they wasn't any work, hours of work were reduced, sometimes to zero-hours. At the same time, when we pointed out that the workmate next to us earned double as much as we did for the same work, we would suddenly start hearing comments on the shop-floor like, "The main thing is that we have a job". The 'industrial reserve army' was back! From then on they were increasingly able to divide workers on the shop floor through the massive use of temp work and short-term contracts. In West Germany in the 1970s, we had learned that, to a large extent, the function of the unemployed 'reserve army' to build pressure on employed workers had been undermined: as long as it was no problem to find a job, you could enjoy paid unemployment as a welcome break. Therefore, we were cautious of using terms like 'reserve army' and, above all, argued against a premature capitulation. We then also witnessed a rapid deterioration of conditions for unemployed workers. The Hartz laws (unemployment benefit reforms in 2004/2005) resulted in a much larger drop of income in cases of (longer term) unemployment. The dissolution of the 'Eastern Bloc' was also a rupture in regards to triggering a new boost in proletarianisation of the global population. While in the Eastern European countries, a type of 'primitive accumulation' took place with former political officials robbing and amassing huge financial wealth through wild privatisations and the masses of workers losing their entitlements to land, accommodation and pensions, which had previously been mediated through the socialist state. On a global scale all regimes shifted towards 'neoliberalism', in addition to increased war scenarios - and for the first time since WWII, also in Europe itself. When the threatening image of 'globalisation' was manufactured in Germany during the early/mid-1990s (after 'lean production' and 'Toyotism' in previous years), Wildcat, on one side, tried to emphasise the trump card workers still possessed ("they need workers' knowledge", "they face high costs for transport and transactions"), and on the other side, to analyse the potentials that lay in the socialisation of production. If the whole world has become capitalist, then there are no non-capitalist sectors available anymore that could provide capital with a reserve of fresh labour power, which means that at some point, capital faces a global working class. With his publication of, 'The return of the proletarian condition' in 1993, Karl-Heinz Roth called upon the left to engage with the question of 'work' again. Countering the propagandists of a postmodern society, he sketched out the "tendency towards ‘one’ new proletariat in ‘one’ capitalist world". He saw a " homogenisation of employment relations towards casualisation, contract work and 'dependent' self-employment ". His idea though that a left milieu, which was subjected to casualisation itself, should have a specific interest in the militant research of class relations, contained a basic flaw: On one side the dissolution of left-wing (infra-)structures and the tendency towards individualisation had already progressed considerably, and on the other side, left academics were still able to find some financial support from universities or research foundations. The traditional left criticised Roth in a rather harsh and dogmatic manner, because he had allegedly given up on central parts of the working class prematurely; his vision of 'proletarian circles' as nuclei for organisation were discarded as sectarian. His prophecies made at the time are astonishingly accurate once they are related to today's conditions. This is despite the fact that, at the time, the changes that he mentioned with regard to the "globalisation of production" were just about to become visible and access to the internet and electronic communication was barely available to the common user. Many hopes regarding an expansion of social revolts have since then been disillusioned and many of his preliminary proposals - mainly formulated in response to his critics - to form international associations were not taken up, or rather, are still waiting to be turned into practice. The main reason though why such proposals were not greeted with a broad-based agreement was the fact that the 1990s in Europe was a decade of defeats, internalised in preemptive obedience by the left through postmodern and poststructuralist theories and its search for the right kind of identities. All attempts of generalisation were destroyed from within. The emergence of the EZLN in the Lacandon Jungle during the beginning of the NAFTA agreement in 1994 put revolution back on the agenda again and opened the way for completely new discourses and high hopes. Even more so when an 'anti-globalisation movement' came together with the organised labour movement in response to the WTO conference in Seattle in 1999. Instead of using the terms 'globalisation' or 'neoliberalism' we continued writing about capitalism and referred to the tumultuous developments in Asia. The term 'global working class' (“Weltarbeiterklasse”) appeared for the first time in Wildcat Zirkular no.25 (April 1996). The article 'World in a Radical Change'  described the process of proletarianisation from Bangladesh to Indonesia to China, which was accompanied by intense struggles and riots and the emergence of a new workforce migrating from the countryside to the urban world: young women, who prefer factory work to the patriarchal rule in the village. These young workers are declared as being a vanguard of the making of a new working class, which is a reason to give us hope again. The article assumes that an "explosion of needs/desires" is the material basis of ‘neoliberalism', which dissolved workers' rigidity in the old industrial nations and which now initiates a global transformation of class relations starting from Asia. The workers in the old industrial centres will soon lose their position of being the only workers able to manufacture cars. The article was a call for inquiry of these changes in Asia, Latin America, and Africa - and for a reconsideration of theoretical “ballast" e.g. in the form of theories about "the new enclosures" or the "end of development". "What is it that we want to hint at: the global working class recomposes itself in an unprecedented scope and speed. This has two aspects and both improve the potentials for communism. 1. The proletariat has become the quantitative majority of the global population or put another way: the departure of the masses in search of their luck is a step towards the completion  of developed capitalism. Only now can what Marx and Engels postulated 150 years ago in the 'Communist Manifesto' become true. In contrast, full proletarianisation (meaning: both wife and husband are free wage-labourers and buy all of their means of subsistence) is desired rather by the proletarians. Full proletarianisation requires a 'welfare state', which transfers income to those who don't work. East Germany was a role-model case for 'full-proletarianisation' - which solved its labour shortage problems with migrants from Vietnam and Mozambique. Based on Luxemburg's thesis that capitalism is not able to reproduce the workforce it exploits, Wallerstein demonstrates that large parts of the global population never achieves full-proletarianisation, but rather that households stay dependent on subsistence production and self-employed activities of all kind. Wildcat pointed out the vulnerability of the new transport chains within the new global landscape, which were otherwise difficult to comprehend due to rapid changes and shifts. We focused our attention on the new locations of production - during the 1990s, automobile factories not only emerged in Asia, but also in Eastern Europe. Helpful in this regard was the book 'Forces of Labor' by Beverly Silver, who, within the framework of world-systems analysis, positioned working class unrest at the centre of her research. She was able to point out that, historically, wherever capital goes, struggles follow: in reaction to the workers' revolts in the 1970s capital built new car factories in South Africa and Brazil - and thereby triggered a new dynamic of powerful workers' struggles. During the 1980s the car industry boomed in South Korea - which lead to similar persistent struggles by a new generation of workers. What was important was that Silver looked at the entire globe and established the fact that 'fixes' were only temporary repair jobs of the system and that capital time and again had to confront resistance - because labor unrest is endemic to capitalism. Though her schematic categorisation into 'Marxian' struggles and 'Polanyi-type' struggles were less helpful. And it is true that there has hardly ever been as much organised resistance against infrastructure projects, dams, power plants etc. - particularly in the more recently industrialised countries like India, Indonesia or China. Whether we grasp them as struggles against 'commodification' - or simply as against the destruction of the basis of livelihood: by now a global experience has emerged that 'technical progress' does not automatically lead to 'development', but is going hand in hand with destruction - and that we can get organised against this. Since the 'oil crisis' in 1973 there have been changes with long-term impacts: today over seven billion people live on this planet. Between 1950 and 1970 the annual growth rate of the global population was 2 per cent, since then the growth rate has slowed down, in particular in those areas where proletarianisation takes place. Employment in agriculture has shrunk dramatically; only in the poorest regions does more than half of the population still work on the fields. The concentration process in the agro-industry continues and peasants turn into agricultural labourers, some of who live in towns rather than the countryside. In East Asia the flight from the countryside leads, to a large extent, directly into industrial work, while in Latin America and Africa it is mainly the service sector that registers growth. Since 2007 (more than) half of the global population lives in urban areas. In the developing countries in particular the mega-cities grow, 80 per cent of the inhabitants live in slums. Slum cities are an expression of the fact that people want to become part of the global working class. They are starting-points and transit-stations for a better life - in the respective or a different country, wherever labour is needed. In the worldwide process of proletarianisation 'mobile labour' (or 'migrant labour') has become the most general form of labour, as much in the form of migration to a different country (e.g. the EU) or as internal migration (e.g. in China, where the government estimates that there are 130 million migrant labourers, out of whom 80 million have migrated from the poorer inner regions towards the coastal towns). The number of international migrants today (2013) is higher than ever before: 232 million (in 2000 there were 175 million), out of which 20 to 30 million are without papers. Their share as part of the total population increased between 2000 and 2013 from 2.9 to 3.3 per cent. The large majority are labour migrants, not refugees or asylum seekers. A noteworthy development is the increase of a proletariat of migrant workers, who - mediated through the international recruitment agencies - engage in 'simple' work in different countries for low pay, but who are not supposed to settle down there: construction workers from India, Pakistan, Bangladesh who work on the big construction sites in the gulf states, who live in camps and whose collective situation has frequently resulted in strikes and rebellion - confronted with draconian repression. Millions of domestic workers from the Philippines or Indonesia etc. who work in rich or better-off households in the gulf states, but also in Hong Kong. Care workers for elderly people, who move from Eastern Europe to the West, in order to work in households that cannot afford to hire a local carer. Increasingly industrial workers, as well, are recruited to work in faraway 'free production zones', in order to undermine the local working class. Peoples' living conditions are largely determined by where they live - but the working conditions of 'simple' workers in the global north and south are becoming structurally more similar. In the assembly plants for the production of complex mass-consumer goods in China and India, too, machinery of the most modern standard is used. Simple manual labour takes place at the fringe-parts of the supply-chain in the slums' backyards, but also in the warehouses of the distribution centres in the heart of Europe or the US. Within the same value chain absolute and relative surplus value production are combined. Up until the crisis of 1973/74, persistent economic growth had more than compensated for productivity increases and for successful 'rationalisation', meaning, the employment rate did not decrease and the welfare state was expanded. Since then, growth of industrial production has stagnated - currently it is around 3 per cent, in the near future around 1.5 per cent? Employment in manufacturing (including construction) has increased globally, but rates of industrialisation like we saw 50 or 100 years ago are not reached anywhere anymore: capital leaves places much faster than in the past, relocates production to 'cheaper' areas or transforms it locally into a 'service' - or stops investing at all. In many of the newly industrialised countries the share of industrial workers has already reached its peak at 20 per cent of the total workforce. Globalisation has resulted in a new polarisation between higher and lower qualified jobs. In the older industrial nations any jobs that require a medium level of qualification are reduced, new jobs tend to be temporary and less well paid. The 'service sector' grows globally - and here, as well, these two poles are replicated: both 'simple work' (cleaning, care-work) and 'non-routine' jobs of higher skill-levels increase, whereas routine jobs of medium level qualifications (accountant, office clerks) decrease: the introduction of computers has made many aspects of this work redundant or it was able to be relocated more easily. This is one of the reasons why the wage gap within the sector widens. Textiles/Garments/Shoes: These are the most important sectors in developing nations. Mainly young women are employed - similar to the situation in 19th century Europe. The 'new international division of labour' during the 1970s had its origins in these sectors. Factories can be relocated more easily, machinery is not particularly expensive. The sector is characterised by small and medium size companies, the profit margins are low. Companies largely depend on supply-contracts with big fashion brands or retail chains. Design and (sometimes) cutting is done separately from the more labour-intensive (outsourced) production department. In 2005 and 2008 global import barriers that were meant to protect local industries were abolished. Today, China (or rather 'companies in China') is the biggest manufacturer worldwide, employing 2.7 million people. Companies with headquarters in Taiwan run factories in Mexico and Nicaragua, companies from China open new plants in Africa. But only in Stalinist or social-democratic storytelling did the working class used to be a homogeneous block. In reality it was very heterogeneous in the 19th century or in 1920, too - and not only in terms of the divisions between male and female workers or locals and migrants. We cannot equate working class with industrial workers! Even in England in the 19th century half of the workforce was employed outside the factory system. And we could also find wage differences of 300 per cent between factory workers with German passports. Historically the working class learnt time and again to struggle (together) under such circumstances. In autumn 2008 an article was published in Wildcat no.82, which engaged with the romantisation of the peasantry by the anti-globalisation movement. The main thesis was that today there is no separate 'peasant question' anymore and that it is rather about the recomposition of the global working class from below. Contrary to this Samir Amin , amongst others, continues to present a classic anti-imperialist position. He still divides the globe up into the triad (EU, Japan, US) and the periphery, in which 80 per cent of the world population live, half of them in the countryside. Without finding a solution for these people, no 'other world' would be possible. Amin reckons that the process which other people call globalisation is actually an ongoing implosion of the imperialist system. He discards the notion of the anti-glob movement to change the world without taking power as naive - as naive as the idea of an ecological compromise with capital. He alleges that the 'imperialist rent', from which the social middle-strata in the global north benefit, is a barrier to the path for common struggle. In order to establish socialism or communism, workers and peoples have to find offensive strategies on three levels, already pointed out by Mao: the people, the state, the nation. A return to the Keynesian post-war model is impossible - history doesn't have a reverse gear. But according to Amin the peasant question is still central: access to land for all peasants and development of a more productive agriculture, opposed to peasant folklore. Building of industry and development of the forces of production. These political proposals are as antiquated as the analysis stuck in the past: by now in China the third generation of migrant workers are working in the global factories. In the process of exodus of millions of uprooted peasants from the rural areas, an industrial working class has been formed in classical ways. The division between urban and rural dwellers has not been overcome, but the former villagers have largely dissolved their ties to the land and, above all, they don't want to return to it! More interesting though is Amin's argument against the idea that the developing countries in the 'emerging markets', e.g. the new Tiger states, Brazil, Turkey etc., could become the new centres of capitalism: according to him the necessary 'security valves' for that to happen are missing in these regions. Proletarianisation in Europe in the 18th century had migration to America as a security valve. Today it would need several Americas for similar processes of industrialisation to happen in the 'emerging market' countries. Therefore they don't have a chance to catch up. This argument has to be further sharpened towards the following question: What happens in the actual and current processes of industrialisation once struggles cannot be channeled into social democracy on one hand or mass migration on the other? Often, we only realise in hindsight if and when a qualitative shift took place. In 2004 the first 'global traffic jam' was reported. The strikes in the Chinese Pearl River delta in 2004 at the peak of the boom marked the first big cycle of struggles in the 'new factories'. Through offensive struggles they gained significant wage increases and had an effect on the situation in factories in the whole of East Asia. In Vietnam, Cambodia, Bangladesh, Bahrain, workers' strikes erupted and with the bus drivers' dispute in Iran in 2006, the first important strike since 1979 took place! A worldwide groundswell of workers' struggles can be retraced from 2006, meaning before the global economic crash. This groundswell transformed into a wave reaching its peak in 2010, when strikes took place in nearly every country in the world, and which opened the way for the political revolutions and protest movements on the streets to come. The latter attracted more media attention, but without the strikes in the phosphate industry in Tunisia and the mass strikes in the textile industry in Mahalla in Egypt between 2006 and 2008, the uprisings in these countries would not have taken place. The years 2006 to 2013 were characterised by a wave of mass protests on the streets, strikes and uprisings on an unprecedented scale. According to the Friedrich-Ebert-Stiftung New York  the wave is only comparable to the revolutionary upheavals of 1848, 1917 or 1968 - the think-tank analysed 843 protest movements in total between 2006 and 2013, in 87 countries, which cover 90 per cent of the world population. Protests of all kinds, against social injustice, against war, for real democracy, against corruption, riots against food price hikes, strikes against employers, general strikes against austerity. (Less positive were e.g. the clerical mobilisations against abortions in Poland). Noteworthy is the large number of protests taking place in 'high income' countries and the fact that 48 per cent of violent protests take place in low-income countries; in most cases they target high food and energy prices. 49 protests demanded agrarian reform, 488 were targeted against austerity policy and demanded social justice, while 376 protests had 'real democracy' as their proclaimed aims. Many protests were expressions of the complete loss of trust in 'Politics'. Nevertheless, in most cases the protestors aimed their demands at the state: the responsible politicians were supposed to act. Often the forms of struggles went beyond traditional demonstrating or striking and were act of 'civil disobedience', such as blockades and occupations. In particular the occupations of public squares and the common organisation of daily life as a form of struggle impacted on the entire Mediterranean region and the US. The comparison with '1968' disguises more than it is able to clarify: 1968 stands for a global revolutionary movement, but 1968 was not the peak year of strikes - on the contrary, these began in the early 1960s and only reached their peak in the mid-/end-1970s. Since the beginning of the global economic crisis speculative, capital has fled towards 'secure' assets, such as raw materials, staple food and agricultural land and thereby, within a short span of time, has triggered a massive hike of basic food prices; these reached historical highs first in December 2007 and then again in 2010. Between autumn 2007 and summer 2008 proletarians in large parts of Africa and China reacted with strikes and uprisings and forced their governments or employers to continue subsidising basic foodstuffs. On the 'squares', revolutionary groupings and tendencies were active, but as a minority. Most of the participants were 'active on the streets' for the first time and demonstrated considerable ability to self-organise daily life and reproduction - but they were not 'political'. The media picture of these movements were largely influenced by the social middle-strata, may be because journalists are best at communicating with people from their own social background. And a mass protest in the capital is more visible than a strike in the provinces. Due to this, the participation of proletarians was largely underestimated although many of them took part and fought the cops on the front lines. But these movements were, in most cases, aimed against the government, against corruption and for 'real democracy' and not for the 'cause of the workers'. The movement seemed to have a global character but remained trapped within the framework of their respective nation states. Many of these movements had 'two souls': on one side, poorer proletarians and migrants who had become unemployed, on the other side, precarious academics who regarded a well-paid job as a human right. The middle-strata were particularly affected by interest policies, state debts and austerity measures - some became more radical and acted. At times they managed the leap into politics and into participation in power through elections - like the Podemos in Spain. In Wildcat no.90 Steven Colatrella in his text, 'In Our Hands is Placed a Power', highlighted that the struggles formed themselves into a global strike wave during the last third of 2010. In 2010 strikes reached a geographical and quantitative scope unprecedented in history. He attributes this to the end of neoliberalism and the re-constitution of the working class. According to Colatrella the expansion of 'traditional strikes' can provide struggles with power and direction and help to overcome the weaknesses of the 'IMF riots'. Colatrella conceptualises the global strike wave since 2007 as 'strikes against global governance', meaning, as a worldwide and simultaneous action of workers in many countries against the same enemy. But simultaneity does not create commonality as such and a common enemy does not necessarily create links amongst those in struggle. Facing stagnating growth rates in the old core countries, capital's hope focused on the so-called BRICS states (Brazil, Russia, India, China, South Africa - where 40 per cent of the world population resides; the abbreviation is an invention of the US investment bank Goldman-Sachs in 2001), which (apart from Russia) contain a young, ascending, industrial workforce who want to claim a better life. Brazil's state president promised everyone a promotion into the 'middle class'. Initially it seemed that the BRICS-states were not affected by the global crisis and state-controlled economies like China seemed 'immune' against it. Idle capital flew towards these regions, the growth rates at first continued to increase, though slower than in the preceding years. But particularly in these 'championed' countries of capitalism, workers managed to enforce considerable wage increases through hard struggles. In 2014 these strikes continued, although in the case of India, against the background of a massive devaluation of the local currency and a decrease in sales in the automobile sector. Since 2013 a lot of capital has been withdrawn from the BRICS states and transferred to the so-called MINTS-states Mexico, Indonesia, Nigeria, Turkey and South Korea - these states, as well, have a large and very young population and at least some of them have been sites of huge protest movements during recent years. In June 2013 an uprising took place in Turkey ('Gezi Park protests') and in May 2015 the entire automobile sector was shaken by a strike wave, in the course of which workers chased away their old trade unions. In Iran, 2014 was the year with the highest amount of industrial disputes and workers' protests. The peak moment was the strike of 5,000 workers in the iron ore mines of Bafgh where workers managed to stop privatisation. They walked out for nearly 40 days until the last arrested worker had been released - it was the longest dispute since the revolution in 1979. How do workers' struggles become revolutionary? Revolution evades derivation from objective conditions. If in a society characterised by patriarchal relations female workers fight collectively for the improvement of their living and working conditions, if they take risks in struggle, cross boundaries, discover new potentials and want to find out more about the world, then this process is probably 'revolutionary'. What kind of notion of 'communism' do workers have in a country where the capitalists are organised within the CP? They will have to develop something new in struggle. This will surely not only start from the factories alone, it needs external impulses e.g. from youth movements that put any- and everything into question. 'Global working class' is a counter-thesis to the idea of a 'national working class'. It assumes that the conditions for an integration of the working class into the state through a (social democratic) labour movement no longer exist. In 1848 workers did not yet have a 'fatherland', a proletarian artisan did not care whether he worked in Cologne, Paris or Brussels. Only state welfare policy and the orientation of the workers' parties towards 'fighting itself into the state' have tied the workers to the nation. Since 1968 a broad and long-term re-orientation of proletarian movements away from the state - and from concepts of the state - has taken place. Since the 1980s the dismantling of welfare has caused a certain 'alienation' of large parts of society from the state, but for the 'central working class' the state still functions: just consider the massive state interventions since 2008 to rescue the automobile industry in Germany, the US and in France. For the traditional left the state is the political field within which the capitalist system can be changed, or rather, its worst consequences can be 'reigned in'. Historically capital was a global relation, mediated through the world market, right from its beginning. But without the state and the law (enforcement) and the national labour markets, capital would not have been able to survive and to develop. The welfare state guarantees certain social securities only for its own population and thereby turns proletarians into 'citizens'. But capital was only able to develop by accessing an industrial reserve army in the form of agricultural labourers, peasants, under-employed proletarians in other countries. Today, in nearly all industrial nations there are multinational working classes without deeper ties to the state in which they live - while the 'local' and 'naturalised' workers and descending middle-strata cling to the state and want special protection. During the last 20 years the class enemy has dismantled state structures wherever they were not able to cope with class struggle: private armies, mafia and civil war rule. This destruction of social security systems caused large-scale flight movements. In such threatening situations 'strong states' or 'controlled democracies' (Russia, China) become more attractive as islands of stability. Where does the working class use the absence of the state to build their own structures? What's the score with a globalisation from below? Today it is possible for workers to establish direct contacts between themselves across, even far distances, without having to rely on mediators. Thanks to digital networks it has become much easier, even in remote areas, to know what is going on in the world compared to three, four decades ago. 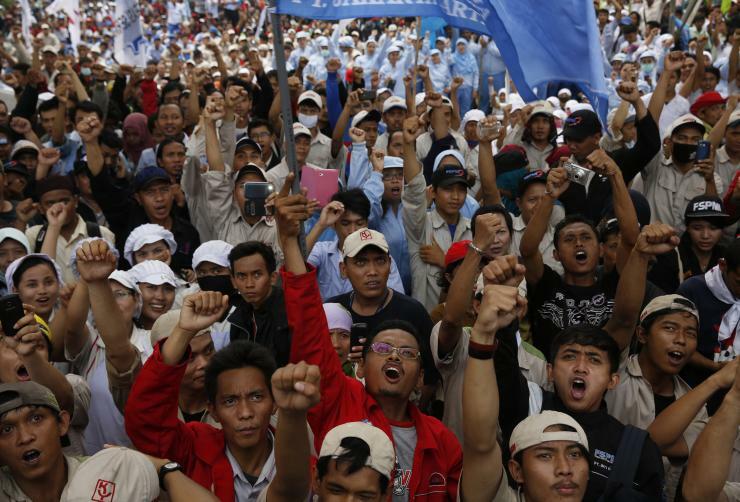 Struggles become contagious if workers in one company see that other workers take a risk and are successful - as for example the strike in the shoe factories of Yue Yuen in 2014 in which 40,000 workers took part. In 2015 around 90,000 workers of the same company walked out in Vietnam, while simultaneously 6,000 workers again went on strike in China. Since the 2014 dispute hardly a month has passed in China without at least one shoe factory being affected by workers' industrial actions. Workers notice their respective struggles, also across national borders - even without visible organisational contacts. Workers of different factories report on conditions and discuss them e.g. on internet forums. In 'Junge Welt',  the Hungarian philosopher Gaspar Miklos Tamas recently said that for the first time in history we face the grotesque situation of a Marxist intelligentsia without a Marxist movement. This brings with it two dangers: on one side, the danger of vanguardism that speaks in the name of a passive proletariat - a proletariat, however, that does not know it is being spoken for and which does not share the vanguard's values that tell the proletariat what it is supposed to feel, think and do. Mainly small radical left groups face this danger. The other danger is that the radical left fuses with the general, democratic, anti-fascist and egalitarian movement - which would cause the Marxist critique to disappear. But there are also efforts by left activists who are critical of the trade unions to organise contacts between different locations of multinational corporations - though it is very difficult to go beyond mutual visits and to actually struggle together or organise solidarity strikes. Over the last five years a different part of the radical left that wants to abolish the state placed their hope in uprisings. The 'movement of squares' in 2011 overtook the debate about the 'coming insurrection'. But Greece in 2008, Indignados, Gezi Park, Stuttgart21, Hong Kong etc. were all movements with hundreds of thousands of participants - but which, in the end, were not able to enforce anything! These movements made visible the potentials that simultaneous uprisings on a global scale have - but also brutally demonstrated their limitations: from the commune of Tahrir to the military dictatorship. The many movements since Seattle, the mass uprisings in Argentina in 2001 and lastly Occupy Wall St. etc., have shown with the utmost clarity that an overturning of the existing social order is only possible once workers take part in the uprising as workers. It is not enough that they take part in demonstrations, but don't go on strike. In capitalism, strike is the ultimate weapon, where real power develops and collective subjects form themselves. Workers ignore old organisations and parties; new ones are not yet visible. There isn't any idea of a new society yet, which takes hold of the masses. In the struggles themselves we can see some new developments though. In Asia and beyond workers have proven extraordinary capabilities to organise their struggles and coordinate them beyond the boundaries of their respective regions. They have understood that they can only win collectively. They raise egalitarian demands against the divisions that capital introduced. They don't let unions hold them back, who want to control them. They don't shy away from hard confrontations. They address and create problems for which the system has no solutions. In their struggles they get into conflict with a social system, which hasn't got anything to offer the large majority apart from austerity politics - a system, which is no longer able to transform the struggles into 'development'. A social system that steers towards its next crash, under the leadership of its 'last superpower', which fights against its economic and political demise by all means necessary. The strongest military power in the world is no longer able to win wars, not to mention to create new stable states, but can only destroy. By doing this it will further undermine the legitimacy of this world order and mobilise more and more people against itself. Who will shape the coming social confrontations? The global middle classes who follow nationalist mobilisations out of fear of losing their social acquis? Or the global proletariat, on whose labour their wealth and power depends? The collective intelligence of the rebellious proletariat is superior to the narrow-minded experts of the institutions; their ability to organise production and to self-organise can guarantee the supply of necessary goods and services for the people - the various movements of the squares and against big infrastructure projects have proven this. They are the only force that can oppose the destructive potency of capital. In Wildcat we have often voiced the hope of an 'encounter of the workers' movement and social movement' - in order to define the role of the social-revolutionary left. As if it was just about an addition of forces, which does not have to hurt anyone. A 'side-by-side' on the 'squares', under conditions of mutual indifference. This won't cut it in future - if we want to get things moving. A new revolutionary subject won't just be an outcome of 'homogenisation' (even less of an 'alliance! '), but rather of processes of polarisation - and divisions within the working class. The political discussion and practice of the left will have to come to terms with this. "Note: There is no simple translation for the German word "Umwälzung". It means transition, transformation, turning upside down, in some circumstances circulation - in fact: radical change." Beverly Silver sees her thesis verified by the struggle waves in 2010: the relocation of capital towards China has created a new and growing combative working class. She still thinks in categories of pendulum movements: Making - unmaking - remaking of the working class, and currently the pendulum is swinging back. According to Silver this time in history it is neither possible, nor desirable, to respond to these struggles in form of Keynesian social partnership. ...In other words: we need to resume a meticulous effort of investigation. We need to go look in every sector, in all the territories we inhabit, for those who possess strategic technical knowledge. Only on this basis will movements truly dare to “block everything.”"
The working class has always been bankrupt; these articles by Wildcat (Germany) just confirm that the 'revolutionary left' has caught up: it is bankrupt too. Despite what I have said above this is still the most prescient article currently on this website.